In a stinging attack on “modern elites”, former High Court judge Dyson Heydon has condemned attempts to exclude religion from public debate, The Southern Cross reports. 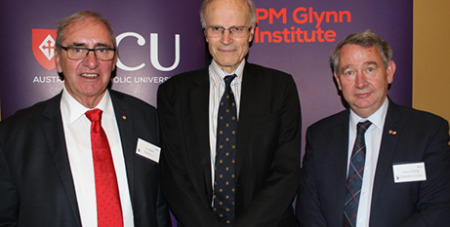 Delivering the inaugural PM Glynn lecture in Adelaide on Tuesday, Mr Heydon referred to Patrick McMahon Glynn’s contribution to the Australian Constitution, notably for ensuring the words “humbly relying on the blessing of Almighty God” were included in the preamble. “Those words reflected what the elite of the Federation generation saw as fundamental,” Mr Heydon said in his address, "Religious ‘toleration’ in modern Australia: the tyranny of relativism". Referring to recently publicised words such as “burn churches, not gays” and “crucify No voters”, Mr Heydon questioned why it was acceptable for one element of public opinion to call for the physical destruction of places of worship and the death of those who worship in them. “That is treated as merely routine, apparently fit to pass without comment. But it is not seen as alright for those who worship to state publicly the beliefs they hold, and to argue, whether on narrowly religious, or ethical or utilitarian grounds for or against particular policy positions under general debate. While a rise in prosperity had contributed to indifference to religion, Mr Heydon said members of modern elites were “moving away from mere indifference” and embracing a “fanatical anti-clericalism”. “Some want to destroy faith itself,” he warned.